DJI's SkyPixel, one of the world's largest photography and videography communities, has announced the winners of its 2018 Aerial Storytelling Contest. Over 30,000 entries were submitted by professional videographers, photographers, and hobbyists from 141 countries. The grand prize-winning entry in the photo category, pictured above, was taken in Northern France by Deryk Baumgartner. 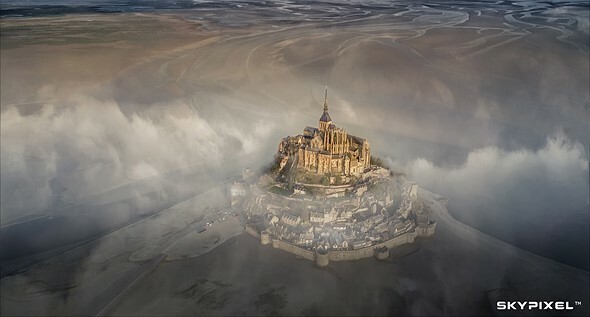 He used a Mavic Pro to capture the sunbathed Mont Saint Michel monastery, shrouded in a thin layer of fog, and framed with snaking ribbons of water. In addition to the Grand Prize, First, Second, and Third prizes were awarded to images spanning four categories: Nature, Fun, Architecture, and Sport. A panel of six judges including Ben Nott, ACS, an award-winning cinematographer and Josh Raab, the Director of Instagram at National Geographic, selected the winners with the exception of People's Choice Prize. To view all the winners, nominees, and People's Choice, for both photography and videography, visit the official SkyPixel Contest 2018 hub. Some shots are really stunning. Loving the ones where you really can't tell what it is in the first place. Like the iced lake which is cracking. I was like: "what the hell?". You need to spend more than a second on a picture and this is, what it is making it special. Mission accomplished. Fun fact which is of course not surprising, feels like 50% of the pics is made during golden hour. Of course no one can bring a big strobe to light the whole temple, so it is obvious, still, I find it funny. Golden hour is usually the ideal time to fly. I've gotten some nice shots at other times of the day but light is harsher. - if it is just outside the tottaly forbidden drone fly zone, it should be at an altitude less than 100 meters (which is much lower than the statue on the top of the church), and this is not the case, the dron is flying very high, around 3-500 meters!!! As always, special permits are allowed for professionals on different contracts. While you are correct (since you probably know the are and the rules there), it is only your assumption that the photographer is breaking the law. The interview of the photographer does not mention any paid jobs, otherwise this kind of permit is very difficult to obtain for this monument, which is one of the most visited in France. Also his drone (Mavic Pro) model suggested he is not a pro drone photographer. I have to agree that all this is only suppositions, I hope that he was flying by the rules. Some of the images here are truly stunning, including the Grand Prize winner and the salt harvest ones - incredible! They make the most of the unique aerial perspective. But I can’t help but feel there’s some pandering to the China market. Granted, DJI is owned by the Chinese, but most of the Chinese prize winners, aside from Alien footprints, range from merely decent to downright mediocre and are totally outclassed by the other winners. The Macau picture is no different from any other of the multitude of city shots taken daily by drone. The Utah picture is particularly bad - it almost completely squanders the opportunity to find new angles in the air. Good photographers equipped with only a tripod have taken plenty of better images of the southwestern landscape. There are many more creative uses of a drone in that environment. That’s not to say DJI shouldn’t engage with its native audience - but rather, pander less blatantly. Surely there must be some great photographers in China. There are rigs that can carry your DSLR but they are pricey. Any nice images of Gatwick airport over Christmas 2018? They still haven't proved there was a drone flying about. More misleading press. Alien Footprints looks like Brazil geographic delimitation actually. These are some of the coolest photos ever. Many look like something out of a dream. I guess I’m just too old school and need to be put to pasture. Some of these look more like cartoons or paintings due to their polishing and editing. Too much for me... They’re all beautiful though, no doubt. Wonderful images although I feel some of them may not have been as stunning before they reached Photoshop. Not that I'm knocking post processing, it's an art in itself, just an observation. Personally, I think it's very rare that you'll be able to pull off a stellar image without some level of post-processing. Hard to believe isn't it. How could you get such amazing shots with such a small sensor. My Phantom 4 Pro takes professional-grade images. I've sold quite a few as prints and got published in book, recently. The Inspire 2, with an X7, can run you upwards of $20,000 USD, so it's not as common unless you're a rich hobbyist or have a booming business. Also looking at hobbyist ones so at least me and my grandsons can go fly. A lot of these winners used a Mavic Pro. You can probably get a good used one for around $600. Very very interesting staff... Good job..! Surely any drone footage that obviously breaks the law would be immediately disqualified? Even in the winners' entries there is footage taken over built-up areas and at heights seemingly more than 400ft. Surely this sort of footage should be taken down so as not to encourage others to do break the law? You aren't serious. And don't call me Shirley. Or not. Some people have way too much respect for the law. It's the biggest business there is. Well . . . if a law was broken, it's up you YOU to figure it out and prosecute, not DPreview. If you think DPreview is able to determine remotely what laws were broken every time someone submits a photo, then you're crazy. @redtailboas- Wow! Robbed any jewelry stores lately? Are you a member of the yellow jacket anarchists in France? @trillium11 - Downed any planes with your drone yet? These winners were determined by a panel of judges SkyPixel selected. DPReview is simply sharing the results. Drone rules differ from country to country and event city-wide. Salt flats was the most intriguing for me. I actually had to read the caption before my head made sense of it. Because, of course, every single photo worth anything MUST "tell a story" nowadays. This trope is becoming so tiresome. Yes. Rod Stewart ruined photography. @MrBrightSide - Nice reference and satire! It's basically impossible for a photo to tell a story. And yes, people trying to pretend they can does get a little old. Time for better ways to talk about the impact of photography. @TMRoper - A single photo maybe. It is not required for a museum, contest or photo stock house. The impact of photography today is in selling a series of photos that tell a story to a publication for a cause or for advertising. Amazing pictures from unique angles, of course. However, I understood it was forbidden to fly drones over Bagan (stories online of police forcing drone owners to delete film/pictures) and many drones are confiscated at the airports. I never saw any drones when visiting Bagan myself 2 years ago for a few days. If both true, should awards be made? Maybe the pilot contacted the AACM beforehand. I hear the drone police are hiring. Funnily, I was looking on the Skypixel website at the entries, and the 1st and 3rd comment on the (unique picture, it has to be said..) Mont St. Michel picture are questioning the legality of taking such a picture, as apparently it's forbidden.. I managed to find an online map from the French government, and it is indeed a no fly zone and from the perspective and proximity, it certainly looks to me like this pic was taken within that zone. It's hard to determine because, basically, if you take off outside a restricted area, and maintain Visual Line of Sight, the photo is legal. That's why drone policing is a waste of effort sometimes, unless the photo was taken in Paris. It's always illegal there. Separately from the legality, don't you feel sorry for all the other people that got up early to watch the "peaceful" sunrise at Bagan? @Kara - as far as I know the zone map (like here in Switzerland) is the last word, there is no "Line of sight" exception to a non-fly zone - it is just a no-fly zone, and that is that, but I would be interested to know otherwise.. There are a number of other restrictions (such as 150m max height) I see mentioned, and tbh the rules seem to be so complex that most people would just TL;DR..
but, back to my main point, the awards seem to have been made to a number of pictures that are legally questionable, and should that be done purely as an artistic award, or should the legality of taking those pictures be established first as an entry criteria? What I don't get is the 'storytelling part', sorry. In that respect it would have been more appropriate in my opinion to link the location to the project of restoring the maritime character and the ecosystem of the Mont Saint Michel Bay which has been badly impacted by tourism and human actions in general during the 20th century...it is the mammoth project to save this UNESCO world heritage site. If you visit the winning page, linked above, it has a complete list of winners and links to the original photos plus videos that were nominated and won. While the video might tell a more in-depth story, a photo can as well. Most photographers went into detail on how they captured their imagery. Good they didn't choose one of those straight from above pictures as grand price. This angle is really starting to get old. There are some really great images here, but "storytelling"? The official contest page is linked in the main body of the article. I would visit as there are video winners as well. The pictures, individually, tell a story and most contestants gave context. But Kara, the winning picture /does not/ tell a story. Sure the photographer told a story /in addition to/ submitting the photograph. The photograph is great but it's not the photograph which tells the story. The same is true to a greater or lesser extent with most of the images. I thought a but was coming. Some really amazing images. "Hong Kong" did nothing for me. But other than that one image...my reactions ranged from "pretty damn good" to various versions of "wow!!!" hong kong small planet is a very interesting composition. burden salt harvest is a nice quirky pic. ducks look like flowers. castle needs to be appreciated with a larger pic. The salt harvesting image has it all , you could not choreograph it better , light shadow and graphic excellence . I hate those silly things flying about everywhere, but these images seem to justify their use by creatives. Respect to Tuấn Nguyễn . It reminds me of the "Sorcerer's Apprentice," in Disney's "Fantasia." For the first time I can say "drones are not useless"
do you know in how big variety drones are used today? video and photography in just one small portion of this. i would say military drones with guns are useless and dangerous, but somehow that is not a problem. its really sad, how people are bothered by this hobby drones, all other stuff, which upsets wildlife (hunters, atv's, motorcycles etc), and have probably (sorry, not probably, but proven as a fact) bigger risk to safety etc are ok. same with privacy etc: drone with wide lense and 50m in the air is a problem, your neighbour, hidden in your backyard, shooting some ultrazum camera is not, not to mention at least 5 online cameras in your home etc. My winners are Alien footprints and Salt harvest , very impressive ! I never had any respect for drones.....until I saw these pics. I dont roam Instagram type sites so I havnt seen many drone photos. These were very interesting to view. If I owned a drone I would immediately be racing it, so its good some people use them for photography. Wow, some of these are really quite good indeed. I'm not usually this impressed by the results of photography contests, but there's some great stuff here. Agreed, thank you for your comment. And, ironically, all we taken with modest cameras while all the boring contests we’ve seen were taken with “pro” equipment. All nice pics. I could use some insights on what “storytelling” means in this context, though. Some of the animal and people picture seem to have a kind of story (feeding time, working, going places) but what story do the desert or lake pictures tell? The more artistic things become, the less I seem to understand. Might have to belong to The club. I enjoy some pretty abstract art but I dont know the rules. there's no rules in art. Love them all. Drones are such great tools for gaining new perspectives! Yes, but I don't want to know how many of the thousands of pictures disturbed people or animals in closed areas or in forbidden places. That's not reported. How can a drone be referred to as taking a "nadir perspective"? Aren't drones the opposite of a low point? Nadir is a commonly used word among drone users for shots taken with camera pointing directly to the ground. The camera on typical drone is mounted on or integrated into a gimbal. It can be remotely tilted from 0 to -90 deg. 0 deg meaning the camera is level with the ground and pointing directly forward. At -90 deg the camera is pointing directly to the ground below the drone hence the "nadir" shot (of the "lowest point"). Might not be the most scientifically accurate term but to drone people it is term commonly used to discribe those type of shots. Thanks. I did not know that. I can sort of see that linguistic logic. So that, ironically, the very tip-top of a mountain could be the nadir, if one's drone is hovering directly overhead. As I've already explained, nadir is opposite of zenit in terms of direction of view from ones view point. Zenit is up, nadir is down. In case of drone, when a drone is hovering above a landscape or any object and the camera is tilted all the way down ( for most drones it is -90deg from its forward pointing level position ), the drone fliers commonly call that type of shot "nadir shot". Hope it makes sense. I really would love to see these images on a 16k screen. Landscape photography has changed quite a lot since great sensors and drones came in. These images show you can still easily tell the wannabees from the better photographers. Those dronephotos are very likely shot in 4k or less. So assuming more than 8-9 MPixel is very unlikely. Your 16k screen would be ashamed not to get filled with data. The drawback of most recent drones. Most are taken with the 20MP Phantom 4 Pro or Mavic 2 Pro. I was amazed to see that a portion of the winners used a DJI Mavic Pro. It carries a 12 MP camera. Well, ok. 8k will do. I agree... this is one of the very few galleries where I like every picture. The balloonpicture and the tower are a bit too commonly seen (and getting boring), but the rest is awesome. The ducks and the waterflower rock hard. Maybe the fact we all like these has more todo with this contest’s judges rather than just the entries. ducks, salt and the castle are the best!